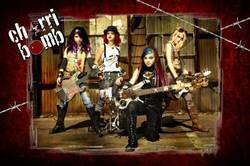 Madhouse Music Productions introduces Rock's New Generation - "Cherri Bomb", and their first video “Spin”. Madhouse Music Productions is excited to introduce Rock's New Generation - "Cherri Bomb", and their first video “Spin”. The video and hit single showcase the girls’ energy and musicianship as well as this unique band’s ability to deliver a powerhouse sound. In the video, while practicing in their actual garage, the girls get pestered by an amorous fly named "Guido" for their affections and the girls want no part of it. You’ll have to watch the video to see how this unlikely romance turns out. “We love rocking songs and the video was a blast. It was a little difficult though relating to a CGI fly that was added in later but it was cool how it all came together!” said Julia Pierce 13, the band’s lead guitar player and singer. Madhouse Music Productions is excited to introduce Rock's New Generation - "Cherri Bomb", and their first video “Spin”. The video and hit single showcase the girls’ energy and musicianship as well as this unique band’s ability to deliver a powerhouse sound. In the video, while practicing in their actual garage, the girls get pestered by an amorous fly named "Guido" for their affections and the girls want no part of it. You’ll have to watch the video to see how this unlikely romance turns out. “We love rocking songs and the video was a blast. It was a little difficult though relating to a CGI fly that was added in later but it was cool how it all came together!” said Julia Pierce 13, the band’s lead guitar player and singer. Julia, Rena, Nia and Miranda have been working to create a unique all-girl rock band for nearly two years. Why unique? The girls range from twelve to fourteen years old, really play instruments, can all sing lead and are intent on bringing rock ethics back to an industry that has succumbed to the predictable formula of teen pop and American idols. Ana Lovelis, the band’s artistic director and singing coach, adds, “In the music industry it’s very rare to find girls of this age with all the ingredients needed for success combined with a work ethic that matches far more seasoned performers”. The single "Spin" is available on iTunes, Amazon, and eMusic. You can see the video on YouTube at: http://www.youtube.com/cherribombband or on the band’s home page: http://www.cherribombband.com. Rising from an intense search for the most talented girl rock musicians in the LA area comes the uniquely explosive alt-rock band "Cherri Bomb". 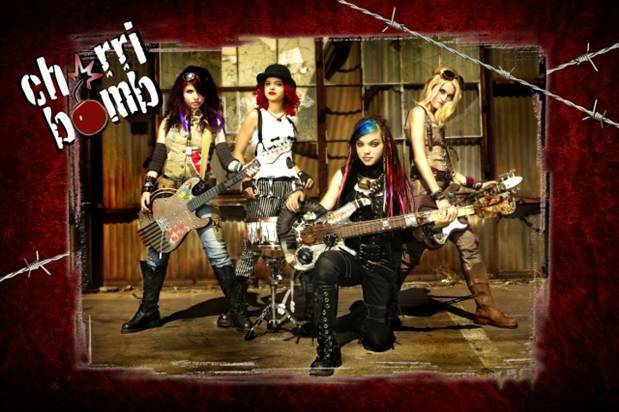 Cherri Bomb combines classic and current rock influences and blends alt-rock sensibilities with a pop edge to stir up rocking, radio ready, uber-memorable songs. The band was formed in ‘08 by lead singer & guitar player Julia Pierce-13 formerly from New Jersey. Her dream was to create a monster rock band. With the addition of Nia Lovelis-13 on drums, a hard-hitting drummer from NY whose influences range from John Bonham to Josh Freese, Miranda Miller-14 originally from FL and a multi-talented guitar & keyboard player, and Rena Lovelis-12 also from NY and the youngest member on bass, along with their newly adopted slogan, "Rock's New Generation", the band was complete. The band has played some impressive gigs including the NAMM show, the Roxy, opening for the "Chelsea Girls", and a July 4th extravaganza for 30,000 fans at Warner Park, CA. They have also received a Certificate of Recognition from the City of LA for their commitment to the community. Located in Los Angeles, Madhouse Music Productions was formed as a partnership between Ana Lovelis, Steve Pierce, Howie Anderson and "K-dog"- Kenny Enea. Four individuals with diverse musical and business backgrounds make up the creative and administrative team that is the force behind the teen rock sensation "Cherri Bomb". The goal is to provide an alternative to the corporate machine-generated pop and R&B genres in this age range where rock has lagged behind for too long. The mission is to bring the basics back to music, teaching kids the fundamentals of playing, timing, dynamics and harmony. Madhouse Music Productions takes a limited number of submissions per year. Contact Info: Kenny Enea - kenea(at)mhmprods(dot)com for submission requirements.